Ah, how sweet to find evidence of that singular passion, the passion that creates a scenario in which an actor is in fear of his life over something as inconsequential and supremely powerful as a movie. Powell's little "Keep rolling," says it all. Principal actor Eric Portman was nervous of Powell but as this could only help sharply define the sickeningly nasty character he was playing, I wondered if Powell ever bothered to disabuse him. Movies are made embedded in all manner of contexts. It's fair to say that the Second World War was a giant context, one that we comfortable baby-boomers onwards just experience third and fourth hand through newsreels and movies. The Holocaust was some raging, unspeakable nightmare within that war and even from a distance of sixty years, it's still a great shock that a nation could be so completely swayed by a maniac's vision. At least Bush's approval rating is low right now which says something positive about the American people. In fact, on the day of writing this, the African-American population of the US turns in a Bush Approval Rating of (oh joy) a mere and very minor 2%… The Big Easy has spoken. Can everyone else speak a bit louder now? 49th Parallel is Allied propaganda, no doubt, but it's also a fine movie. This is no Riefenstahlian triumph of the repetitive lie. It's a great British film-maker and his great Hungarian writing partner making an entertainment that gives colour and shade to moral principles deemed so important faced with such an enemy in wartime. Of the band of Nazis on the run in Canada, only one has slivers of humanity poking through (for this transgression he is summarily executed) and the others are just kids whose souls have been snapped. In their place are frightened, inexperienced Nazi engines. Their leader (Portman) has the awful swaggering confidence of supreme arrogance. Funded by the British government in the midst of the Second World War, 49th Parallel is a liberal hearted pleasure and a damn fine war movie to boot. Off the coast of Canada (P&P certainly got about a bit), a U-Boat surfaces. Their captain surveys the boat they've just wrecked treating the survivors like scum. These men are Nazis and therefore very easy to despise. 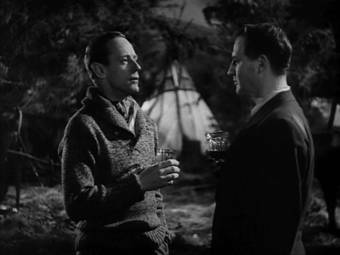 Lieutenant Hans Hirth (an all too believable, cold, hard Eric Portman) is sent ashore to secure supplies from the Hudson Bay Trading post. But what's this? The entire Canadian air force, all three bombers (and this was true if Powell's memoirs are to believed) send the U-Boat to hell and I can't tell you how refreshing it was to see what looks like a real U-Boat going kaboom (it was, in fact, a full size prop that almost brought the production down when Newfoundland customs wanted to charge the film makers $22,000 to bring it over the border). Film making, tchah. Cut off from their metallic haven, the Nazis now find themselves in hostile territory – or do they? In a series of narrative steps, our Nazis encounter different examples of 'free' men living lives dictated to by nothing but the vagaries of the weather and height of the corn stalks. In short, they are to be given life lessons by the effortlessly good people of the Allies and each has a point and the only Nazi to be affected is the one truly rounded human being of the bunch. At first they hole up at the Hudson Bay shop and take hostages, the older owner and a trapper who's fresh (not the right word for a man who has spent two years trapping and living rough) from his work. Slowly he is filled in about the Nazi threat only moments later to have six of them take him prisoner. A short digression. I have enormous respect for the acting profession. I also can understand how extraordinary it is when a Brando blossoms or a Pacino punches through. There are defining performances and one man stands taller than most. This particular actor was, in his lifetime, regarded as the greatest actor of them all. His fame drew from astonishingly powerful performances that helped to turn him into a household name (well, the performances and the fact he snared the most ravishing creature for his wife, the Audrey Hepburn of her decade). Yes, it's Laurence Olivier and Vivien Leigh. But those performances were all theatrical – even on film. I could never be comfortable with Olivier because of that clipped but strident delivery, that Shakespearean über-projection that made each syllable sound like it had its own appreciation society. That said, he was chillingly brilliant as 'the White Angel' in John Schlesinger's Marathon Man. And here he his, unbelievably miscast (forgive me) as a French Canadian, flouncing about the screen sounding like Steve Martin with a comedy accent. You simply cannot take this man seriously and it punches the movie in the solar plexus a bit but Portman remains ice cold and so the movie is carried along with him. A few airmen are sent to check out the outpost and together with the Eskimo villagers, they are all despicably gunned down as they run for their lives. The propaganda is at full force here as we see a mother and child lying dead. 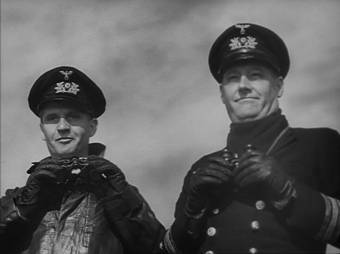 The Nazis are thinned out as they try to escape in the Canadian seaplane and when an terrible oversight tells the men all cramped in a small cabin that their plane is about to crash, it's real sweaty palm time. Powell works wonders with just a small area (he gives us a interior reverse – from behind the stricken Germans – of the plane lurching in the air which is uncomfortable and wrenching). The crash itself is handled superbly well (echoing Hitchcock's one take crash into water a year earlier in Foreign Correspondent). From here the Nazis are taken in by a German contingent, full of Amish-lite, fresh faces who work the land. It's here that the only human Nazi makes the misstep of going back to what he used to love (baking) before the war scooped him up. Completely misreading his hosts, Portman delivers his racial purity speech which goes down (now, correct me if I'm wrong but should it be 'goes up' like a lead balloon?) I mean a lead balloon goes down superbly well. I digress. The leader of the village, David, played by Anton Wallbrook, gives as good as he gets and again, as per his immigration speech in The Life and Death of Colonel Blimp, he stops the movie in the best way just to have us admire passionate and achingly 'real' acting. Fleeing to Winnipeg, the remaining Nazis witness a native American parade (shades of Powell foreshadowing the Holocaust atrocities via America's settlers' treatment of the Indians? Tempting to go there but no one knew of the final solution in 1941. It officially came into being after a famous meeting in January 1942). It is now left to Portman and one other survivor to face two of the Nazis' biggest threats. England and the United States. The absolute Englishman, the actor for whom the word 'personification' was created dons his pads and steps up to bat. This is Leslie Howard and everything about him screams middle class privilege. Portman belittles him, accusing him of cowardice. He baits Howard into a petty argument and Howard's enlightened response is worth quoting: "We've been given reasoning powers. Why don't we use them instead of hitting each other?" But the 'spiteful little schoolboys' tie him up and flee. Portman escapes but so does Leslie Howard (with the terribly, terribly English moniker 'Philip Armstrong Scott' just watch the Union Jack jumping at those syllables). Cornered, the penultimate Nazi starts firing. Howard walks towards the gunman and coolly counts down the remaining bullets as they are fired at him. This was concrete upper lip time and although somewhat unbelievable, I bet it gave 'our boys' a boost to see what 'an unarmed decadent democrat' could do against an 'armed superman'. He gets hit by one bullet but as we now all know, you don't just slam your hand on where you think you've been hit and then limp a tiny fraction for the rest of the movie. Powell is forgiven. Finally, Portman stows away on a freight train to be confronted by the very personification (these actors personify, honestly) of the mighty United States of America, Raymond Massey. To reveal more would be churlish of me. 49th Parallel is one solid stare at 'good and evil', the analogy of the nasty strain of disease (Nazism) invading a healthy host (Canada) and how that health fights back. It's also a very entertaining romp and a first class Archers picture. This repackaged Silver Collection disc is comparable to their A Canterbury Tale (also repackaged for this collection). The print is only a few notches above shabby with lots of dirt and scratches evident. The blacks come through well but the print is a little thin. The Dolby 2.0 processed soundtrack is fine as in everything has come from the original mono intact. The subtitles are intact and clear and mercifully drop shadowed but only just. As it's the Silver Collection again, I expected the trailer to be their own corporate one but no! It's the real trailer and a fine example of the genre too.